A healthy knee can flex, bend and straighten easily and without pain. While the knee’s function may seem simple, a knee injury can be complicated, annoying and painful. Since knees are fundamental to walking, running, kicking and sitting, an injury can derail many of life’s enjoyable activities. If you have suffered a knee injury, your physician can help guide you to the right brace to help rehabilitate and facilitate movement. This guide is intended to offer you a quick summary on what types of knee braces are available and their usefulness. Post Operative Knee Braces / Post-op Knee Braces As the name implies, these braces are used for post-operative support and rehabilitation. A quality post-op knee brace should be lightweight, but durable. Depending on your rehabilitation needs, you may need a brace with a full range of motion, or one with immobilization or limited range of motion settings. Post-op braces are available in different lengths, often feature moldable pieces, and should be easily adjusted for a perfect fit. Look for breathable materials and user-friendly adjustment features. Functional-OA Knee Brace Osteoarthritis (OA) affects over 20 million Americans and involves the erosion of joint cartilage. A functional-OA knee brace can be used to stabilize knees suffering OA symptoms, reducing pain and additional erosion of the joint. Typically a knee is affected on either the outside (lateral) or inside (medial) of the leg, though it is not unheard of to have a knee with OA symptoms on both sides of the knee. The brace hinge should be situated on the side or sides that are affected, and should be lightweight, durable, and easily adjustable. Since they will be worn for an indefinite prolonged period of time, comfort is very important. Functional-Ligament Knee Brace The stability of the knee joint is maintained by four ligaments, the ACL, PCL, MCL, and LCL. A common sports injury, a torn knee ligament is usually treated with a functional ligament hinged knee brace. Torn or unstable knee ligaments require a lightweight, durable brace that supports the joint. Look for braces that offer the four-point principle for biomechanical stabilization. Contracture Knee BracesA knee contracture is the shortening of a tendon resulting in a restricted range of motion and pain. Under medical supervision, a contracture knee brace can be used to support the knee and increase flexibility over time. Look for adjustment range, comfort, and durability. Padding should be breathable and non-irritating. Contracture and post-op knee braces are occasionally interchangeable. About MMAR Medical Group: MMAR Medical Group Inc. is a supplier of orthopedic medical products including a wide selection of braces and supports. 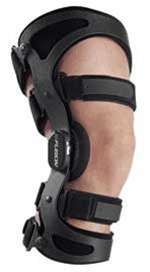 To find a quality hinged knee brace or diabetic footwear and orthotic inserts please visit www.mmarmedical.com .